Nicholas Keith Rogers was born in Orlando, Florida February 1, 1979, the son of Robert (Bob) and Penny Rogers. He and his parents moved to Deltona in 1980 where Nick grew up helping the community by always welcoming new residents as they moved in and with the Boys Scouts Troop 565.Nick attended Deltona High School and was a member of the Deltona High Blue Brigade Band from 1993 through 1997. After Graduating from Deltona High School, Nick completed the Emergency Medical Technician program at Daytona Beach Community College (DBCC).Nick and Kelly (Williamson) his High School Sweetheart were married on July 14, 2001. He was a devoted family man and loved spending time with his daughter Jocelyn who was born March 20, 2003. Their second Daughter Isabelle Madeline Anne is expected in January 2007.Nick Enlisted in the Army in February 2005 and completed his basic training at Fort Benning, GA. He attended Advanced Infantry Training (AIT) to become an Army Medic at Fort Sam Houston in San Antonio, Texas and was assigned to the 10th Mountain Division of Watertown, New York. 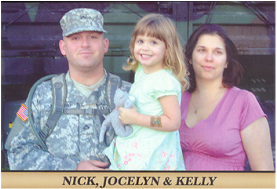 He deployed to Iraq on the 15th of August 2006 and was killed in Baghdad while on patrol October 22, 2006.The statement from Nick’s Army Commendation Medal tells the story of what happened on October 22, 2006. The Army Commendations Medal with “V” device is issued to Specialist Nicholas K. Rogers for valorous heroism in the face of adversity and overwhelming odds during a complex ambush on 22 October 2006. Spc. Rogers moved while under heavy small arms and rocket propelled grenade fire, to his M240B machine gun and began suppression fire. His actions allowed the pinned down members of his platoon to move into position and achieve fire superiority and suppress the enemy attack. Spc. Rogers’ courageous deeds were vital to the survival of all the men in the platoon. Spc. Rogers’ conspicuous gallantry reflects distinguished credit upon him, The 4th Battalion, 31st Infantry Regiment, The 2nd Brigade Combat Team, The 10th Mountain Division (LI) and the United States Army.